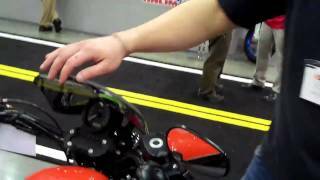 This small, sporty shield will look great on your bike with its almost invisible mounting system. Plus, a quick turn of the wrench lets you adjust the shield's height and/or rake angle to suit your style preference or wind protection needs – in less than a minute. Highly engineered, beautiful, and versatile... you'll love it! * Requires BAG#1030; Supplementary spacer kit. 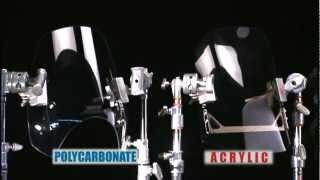 Gladiator Windshields are designed to work with original parts in original configurations only. Installation of additional accessories or customization may affect ability to install shield. Finally, a custom look in windshields that's worthy of your big iron – the Gladiator® Height/Rake Adjustable Windshields from National Cycle! 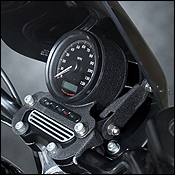 The custom, fully-adjustable mounting brackets use our patented DualPivot™ action to allow a wide range of windshield height and rake angle settings for different rider heights or changing wind protection needs. Position it low and raked back in hot weather, and high and mighty for more wind deflection in colder weather. Height and rake angle can be changed in two minutes. In a complex world, it's satisfyingly simple. 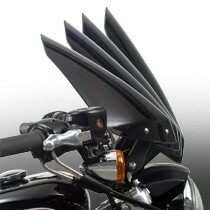 The stealthy shape of the Gladiator Windshield looks great on everything from custom bikes to bone-stock Harley's. The almost invisible mounting bracket on this unique windshield provides a clean, uncluttered appearance. This look is achieved by attaching the bracket directly to the top clamp, leaving the bike's handlebars and fork tubes bare. 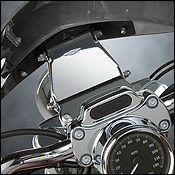 The style of the mounting bracket integrates completely with the style of your bike, whether you need a show chrome finish or wrinkle-finish black. Model-specific Mount Kits and all hardware is included with each windshield. Mount Kits are finished in Chromed steel and stainless steel or Wrinkle Finish Black to match each model's original factory finish. All National Cycle polycarbonate windshields are covered by our 3-Year Warranty against breakage.